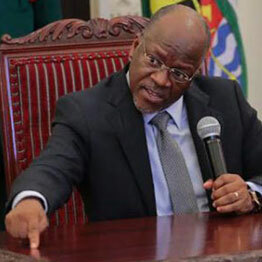 Tanzania's President John Magufuli has urged women to stop taking birth control pills, saying the country needs more people. "Women can now give up contraceptive methods," Mr Magufuli said. Mr Magufuli made his comments at a rally on Sunday in the northern Meatu district, saying people who use family planning methods were lazy, the local Citizen newspaper quoted him as saying. "They do not want to work hard to feed a large family. And that is why they opt for births controls and end up with one or two children only," he said. "I have travelled to Europe and elsewhere and have seen the harmful effects of birth control. Some countries are now facing declining population growth." Opposition MP Cecil Mwambe has criticised the comments, saying they contradicted the country's health policy. Tanzania has a population of around 53 million people, with 49% of them living on less than $2 (£1.50) a day. On average, a woman in Tanzania has more than five children, among the highest rates in the world. The day after Mr Magufuli's comments, speaker of parliament Job Ndugai banned female lawmakers from wearing fake nails and eye-lashes in parliament. Mr Ndugai told the BBC's Focus on Africa programme that the ban was because of "health" reasons, without elaborating. The new regulations also ban women MPs from wearing short dresses and jeans. Female visitors to parliament will also be expected to adhere to the dress code.